Not sure what you need for your Home Studio? You should definitely read this post. This post covers the Home Studio essentials. I made this post to help cats out that are just getting started in this game. DUH. Most newer computers right out of the box nowadays are pretty good but when you are running a Home Studio you will mos def need one that can handle a load. Especially if you are using VSTs (virtual instruments) as they will really beat on your computer's processor and ram. When it comes to ram, the more the better. (Computers and Computer operating systems have limits to the amount of ram they can accept so keep that in mind as well) Also: Don't buy into the 'you need a mac to do music' hype. PC's are great and from my experience I have found PC's to have more options. Another obvious choice.. But the BIG question is: Which one to get? Well, regardless if you are using FL Studio, Reason, Cubase, Pro Tools, etc. IMO they all (for the most part) pretty much do the same thing....just in different ways. I always see people ask "Hey what do you use?" and I just shake my head. When it comes to DAW's (Digital Audio Workstations) its all about workflow. The DAW that helps you get your idea out the fastest IMO is always gonna be the best one for your Home Studio. With that said, you are gonna have to try em out and see which one has the best workflow for you. Every one is different and most companies offer demo versions that are free to download. This is a must. Although programs like FL Studio allow you to use the Computer's keyboard to compose with, it can be limiting so do yourself a favor and scope out a decent one to add to your arsenal. The best way that works for me is to go to a gear store and check the controllers out in person so you can check out how the keys/pads feel, etc...(you can only do so much research online) and then take a look on Craigslist. Usually people sell there for about half the price as in the store. Also: Nowadays you don't need a big [and expensive] keyboard/workstation like a Fantom, Triton, etc to make and record beats with, so don't make the mistake of buying one when it might not be what you want. Trust me, I blew G's on a few...and ended up selling them because I was able to find similar sound banks for a fraction of the cost. Plus: Most DAW's nowadays are 'all in one' packages in terms of sounds and usually come with Gigabytes of sounds [and probably contain similar sounds and sound banks from those keyboards] in their included sound bundles. If you hear popping and crackling when you use your DAW or if you plan on recording vocals then you're probably gonna need one. Most of the time you can get by using the stock sound card just to make beats but [again] if you plan on recording vocals or adding studio monitors the stock sound card just isn't gonna cut it. The stock sound cards are often designed for basic computing audio needs and won't deliver the quality you need when it comes down to it. There are plenty of USB powered ones available and they all have their strengths and weaknesses. Most have common connections for mic [XLR] cables, headphones jacks and connections for monitors as well. Note: Make sure you choose one that has phantom power to power your microphone. Another huge benefit to having a USB interface is they do come in handy for when you have to take the studio with you. Regardless which one you have your eye on, do your homework! [be sure to read reviews before you purchase] and I'm sure you'll find one that will suit your needs. On a Sidenote: The first audio interface I bought years back died in less than 1 year from only moderate home studio use so do yourself a favor and read up! A lot of people tend to overlook this one but anyone who's ever bought a USB powered audio interface and then switched to an internal "pro" soundcard has probably noticed the immediate difference. While USB Audio interfaces work well for most home studio use, when you really start to expand your rig you may want to start looking into this upgrade. For me, I noticed as soon as I installed my soundcard I had zero popping and zero keyboard latency issues. If you choose to get a soundcard, you may need a 'volume controller/mixer' like the "Mackie big knob" to have control over the volume parameters, so keep that in mind as well. Now, you don't have to buy the 'best' monitors (subject to opinion) but you do want some with accurate reference. Built in amps is a plus. Over the years I ran thru countless sets of monitors before I settled with what I currently have and I must say it has been my best investment. Once you settle on the pair that's right for you, learn em. When and if you decide you want to record vocals, instruments or Foley effects, etc..you will eventually need to get a quality mic and/or preamp combination. This is tricky because depending upon your needs this will vary.....bigtime. I personally have a mic/preamp setup that ran me under $500 and it sounds great. Don't be fooled into thinking you will need the most expensive set up to get into the game. P.S. Don't forget to buy a pop filter.. 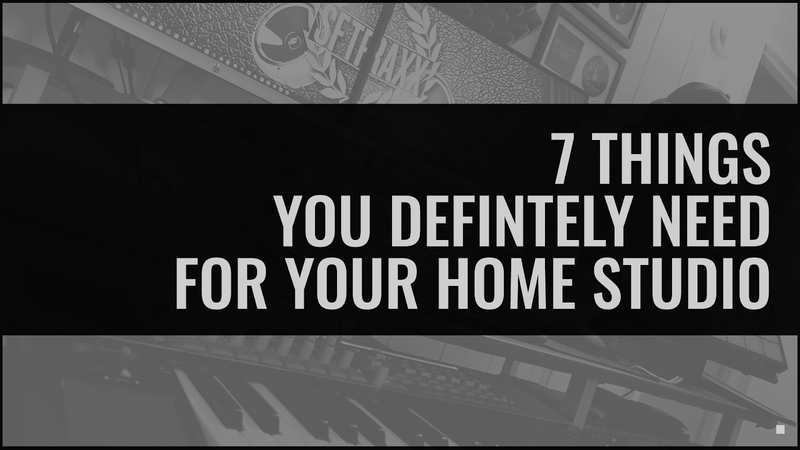 Although the list above leaves out a few things like soundproofing/acoustic foam, cables, dual monitor video cards this list should help put you on the right path towards getting your basic setup up and running. Always remember when it comes to buying gear, the number 1 rule of thumb is to do your homework. This way you buy the right thing at the right time. If you want me to add anything to the list or have any questions about any of this stuff leave a comment.